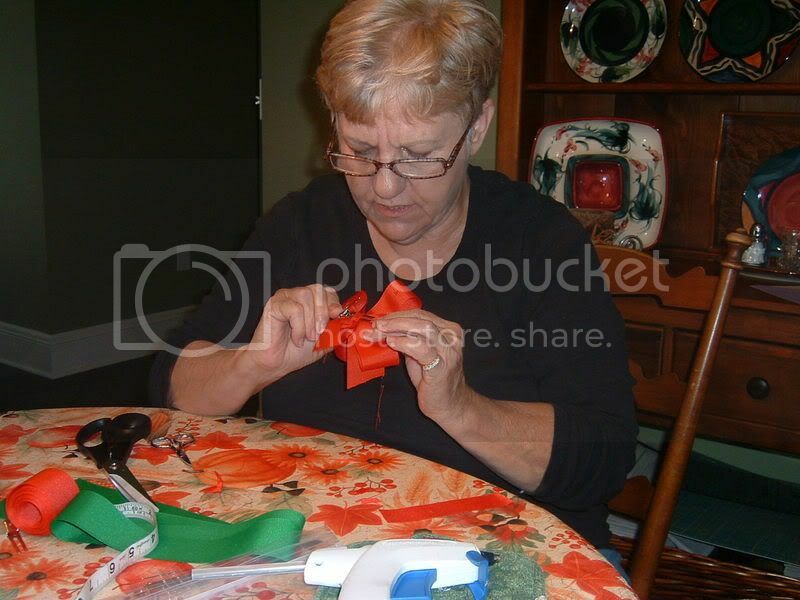 We all want to do something to help and this is a wonderful way for those of us that have embroidery machine. Embroidery Library has offered a free design. Mine are drying now. Words cannot describe the sadness and grief that we felt at the news of the Sandy Hook school shooting. Our thoughts and prayers have been with the community as we struggle to understand this loss. Recently we learned of a great way to support the community. The PTA will welcome the students to their new school with a winter wonderland, and are asking people to send snowflakes to decorate the school. Embroiderers are so generous with their time and talents. We know that together we can fill the new school with snowflakes. Please mail your snowflakes so that they arrive at the PTA office by January 12th, 2013. Thank you! 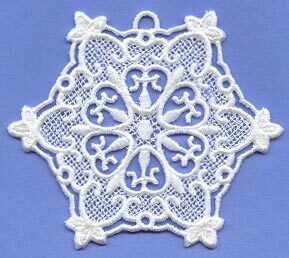 If you're new to making freestanding lace, click here for a free tutorial! I followed the instructions for using the Floriani perfect stick tearaway. I knew since the towels had some body to them, getting them hooped was going to be a problem so I went hoopless. The problem came up when I tried to remove the stabilizer, it did not release like the instruction said it would. I asked for suggestions and found water would work in getting rid of the bits. No where in the Floriani instructions does it give you a clue this might happen. they cleaned up pretty good but I had more towels to do, towels with a much deeper pile. Some seemed to have luck adding Sulky Totally Stable between the towel and the stabilizer, so I tried that. I have scribbled on the stabilizer because it is white on white. Then I stuck it to the perfect stick. I make a copy and use those to center my design. It seemed to stitch fine. Yes, I did use a topper. Then the test--tear it all away!! It tore away with no problem, none of the stickies sticking to the loops. I do have some clean up to do, but I am happy with the results. Now, I don't feel so bad about facing the other towels I need to do. My favorite movie, "Its a Wonderful Life" and has become a tradition to watch at Christmas. Tonight, we will pop some pop corn and put in our movie. We have the black and white version which just seems to make it so much better. 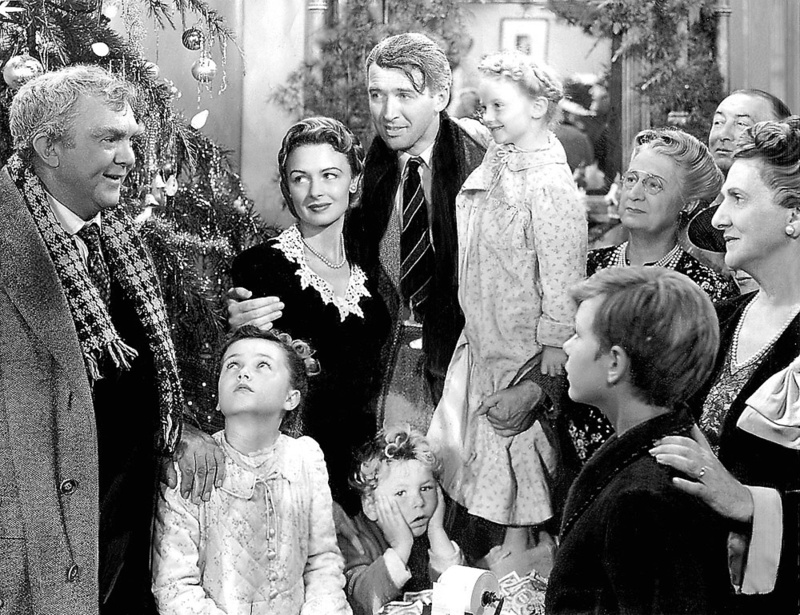 Do you have a favorite movie that just makes Christmas for you? 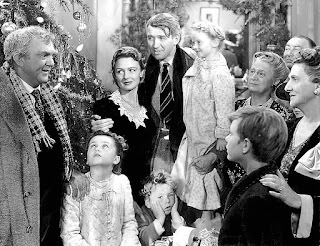 I think I would love to live in Bedford falls. I know I would love to live in a simpler time.Maybe I should say I would love to live in a simpler time AGAIN. Best house on the block! With much excitement Zoe ran into the house on Christmas Eve bearing her precious gift. Zoe, was now in kindergarten and had just finished her first class project, of a Christmas gift. Lots of love went into painting this sweet shop, for it was to be a gift for Grandma. She knew how much Grandma enjoyed putting out the Christmas village each year and how much she looked forward to seeing it brought out. Zoe, was thrilled to be able to add to the village and each year she checks out her little shop, nestled in with the other shops, It is the best house on the block. I added a tea light so it can shine with the other houses. 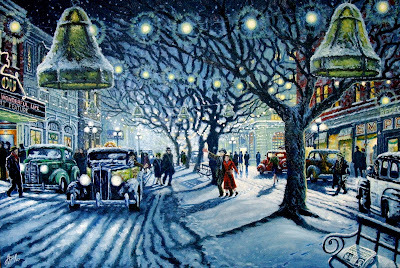 I have been able to enjoy many others tree's and traditions thanks to blog land. I think even though we put the tree's up at Christmas, they become wonderful memory tree's. The Christmas past that we shared with loved ones, that are no longer with us. Remembering the magic from our youth, when everything was just so wonderful. Here are a few of my new memories, since we moved not very many of the old things came with us, but took up residence at our children's homes. This Santa, came to dress our tree when Zoe was just tiny. I had to run to Joann's fabric and put Zoe in the cart, as we passed a shelf she reached out and grabbed the Santa. Zoe, held on to him so carefully that when we got to the check out I knew we would be taking Santa home with us. He has graced the tree every year since. The gold tree is so special to me. We were able to take sis Christmas shopping and this is one of the ornaments she picked up. I just love it, it is so her all glamor and bling. Now, to add the presents and make another year of memories. I enjoy making these snowflakes on the embroidery machine. 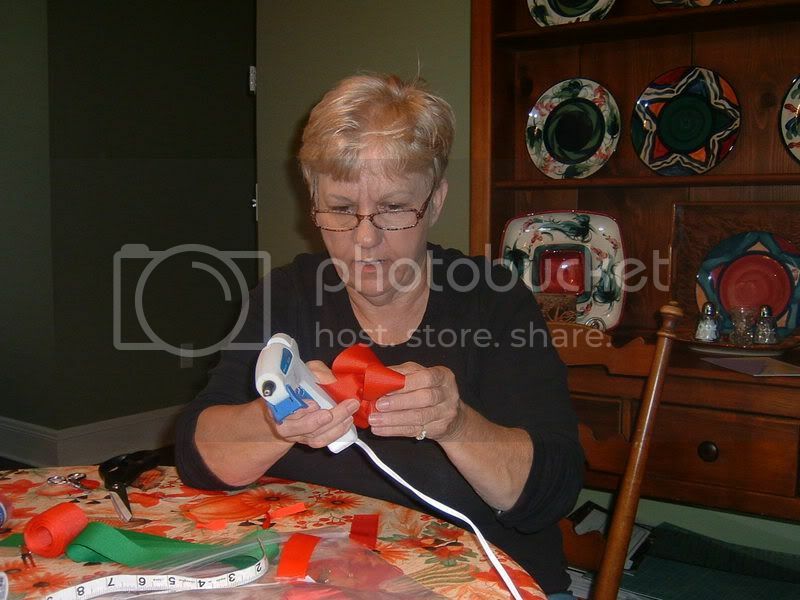 I like to slip them into a Christmas card and give a little gift, that takes nothing but some thread and time to make. My goal for next week, is to get more of these made. Can you believe last year I made dozens and didn't keep even one for myself!! Must change that this season. I have spent more time resting then I care to think about. Thanks to this 'thing' called a computer I have been able to go visiting and my favorite place to visit is blog land. I am not sure how I got to sweet nothings but I am so glad I did. she has filled my days with so much joy and she inspires me to get better and get with the decorating. Not the far out type of decorating you need a decorator for but just down home, surround yourself with comfort decorating. I am totally in love with her style. I feel like I made a new friend, bj is just full of life and so uplifting and positive. 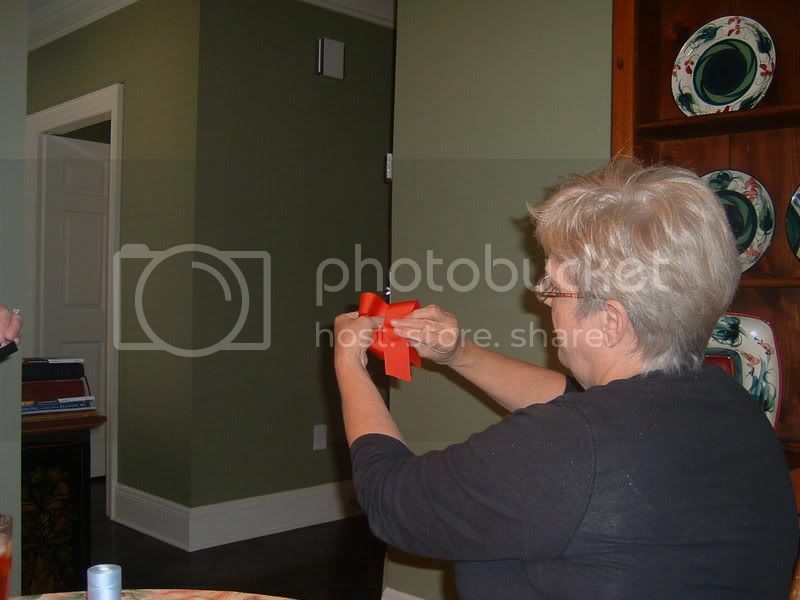 I didn't ask for permission to share any of her pictures so you will just have to go meet her for yourself. I know you will really be glad you did. This year for Christmas I added some personal towels for the kids. I have done pillowcases, nothing fancy just a little something just for them with their name embroidered on them. The picture of those will have to wait. Embroidering on towels was also different for me. I went to the shop in town that sells machines and supplies and they were so helpful. 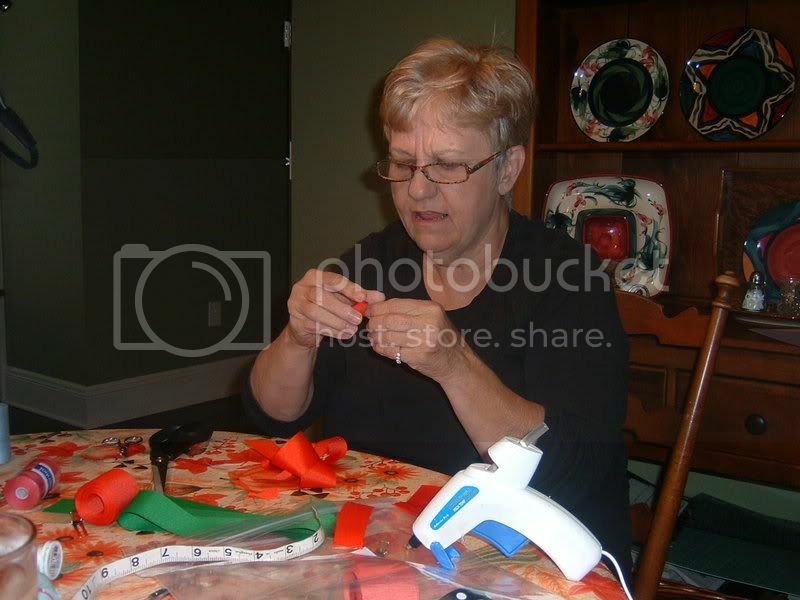 They showed me the type of stabilizer to use and how to do hoopless embroidery. I have some towels left to do so will share their advice with you, although you probably are an expert. I have so much to be thankful for. Just having another Thanksgiving is something I am very thankful for. I am also thankful my fall mums were so pretty this year. We had a wonderful dinner and the only sad part was the little babies didn't get to come as they were sick. Hope everyone feels better soon, fall always seems to mean cold and flu season. Now, it is time to get ready for Christmas. 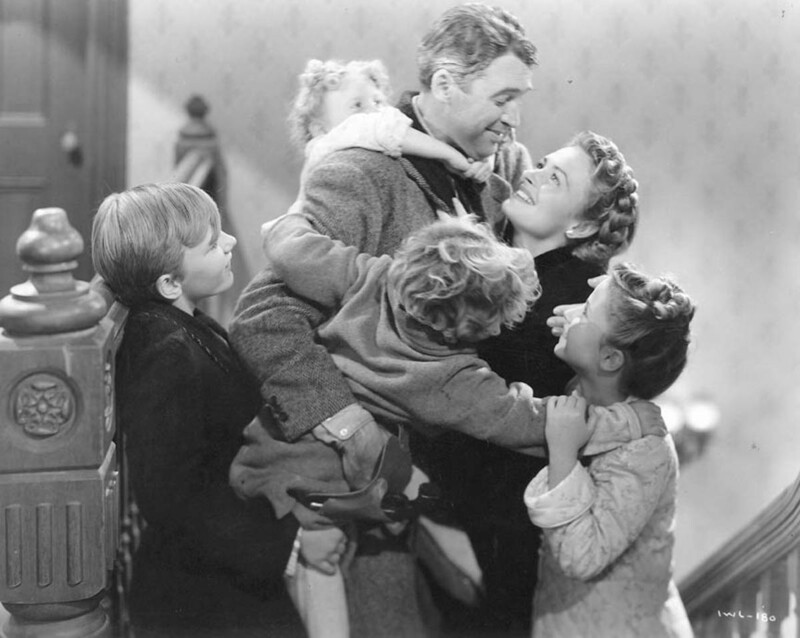 What are your favorite things to do to prepare for Christmas? Mine are sewing, now that I have an embroidery machine, sewing has a new meaning. Love baking especially cookies and candies for the guy's. Then there is decorating, adding little touches of magic all around the house. There are good points about living in Central Washington the biggest is all the sun we get. So, of coarse there is a down side and that is it is very dry here. We had a huge storm roll through about two weeks ago. During that time we were hit with a hundred lightning strikes, I know there were a lot but didn't count them, so will take the word of anyone who's job it is to count lightning strikes. 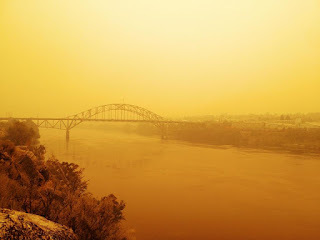 Those stikes started 80 fires, in other words our whole mountain area is on fire and here in the valley we are getting smoke. I always read the description of fall as the smell of smoke in the air. I am sure this is not what they were thinking. 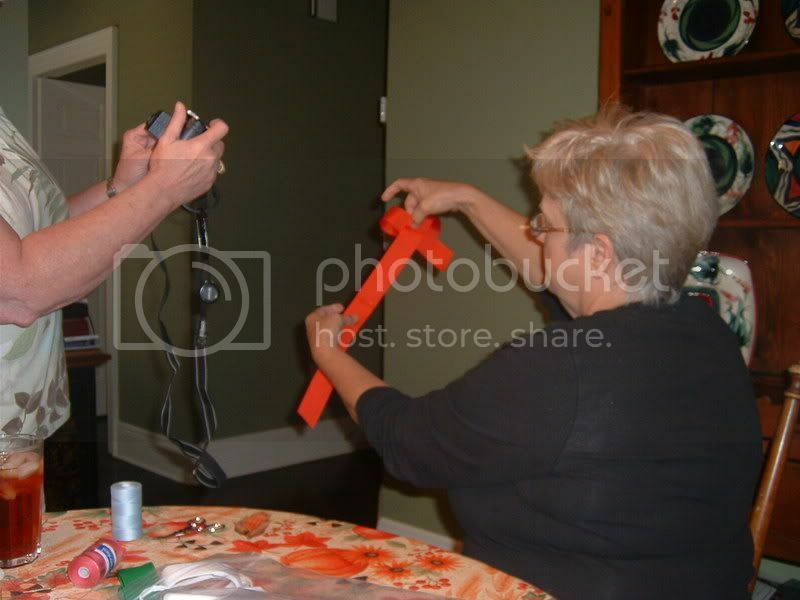 Making hair bows might seem simple to those that are handy at such things. I needed something simple to do while my strength comes back, so I thought about how happy hair bows make the grand daughters. I never seem to find time to make them and now that I have the time I thought I would share a post that was shared on EverythingSewing by Ann a wonderful bow maker. 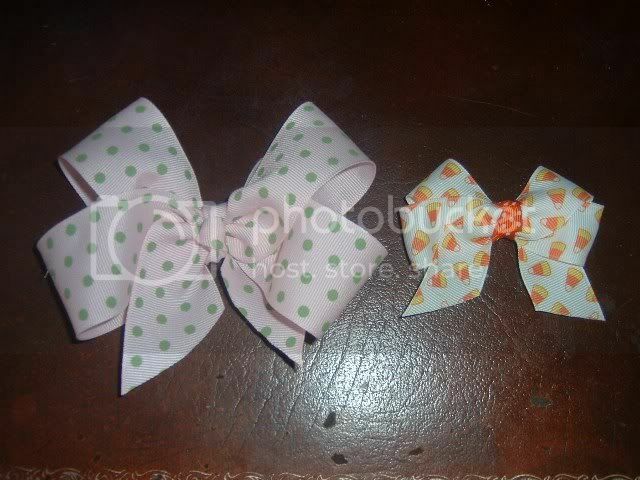 Then I found these pictures of some bows done by my friend Jerry after she had followed Ann's directions. So if you need a little help in making bows, these instructions are just perfect. Ann, you may have created a monster!!! 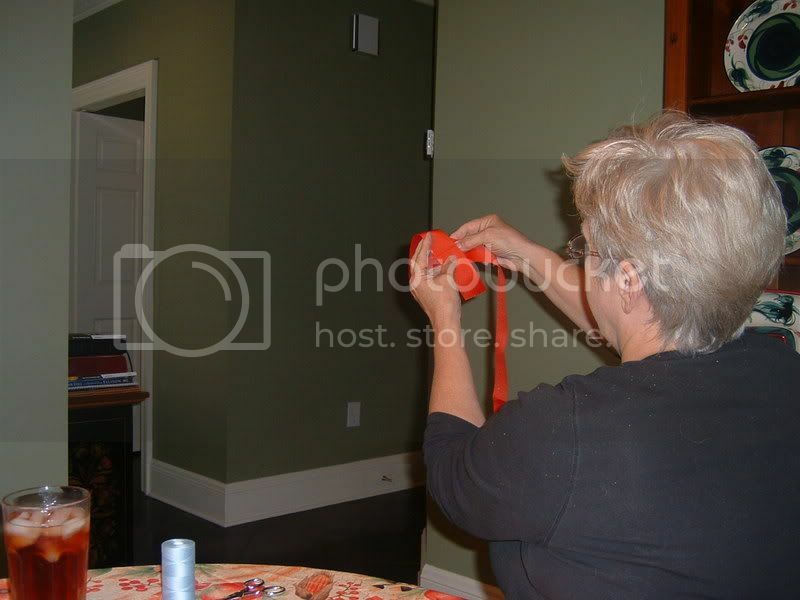 I had just a bit of the candy corn ribbon left after using it in the back tie pillowcase dress that was orange with white dots, so I thought I would see if I could turn it into a facsimlie of Ann's bow. It worked! I still need to practice getting my center knot tight and wrapped tightly around the bow, but for my first practice run, I'm very pleased. 1. Cut ribbon to 29 inches. This makes approximately a 4-inch bow. 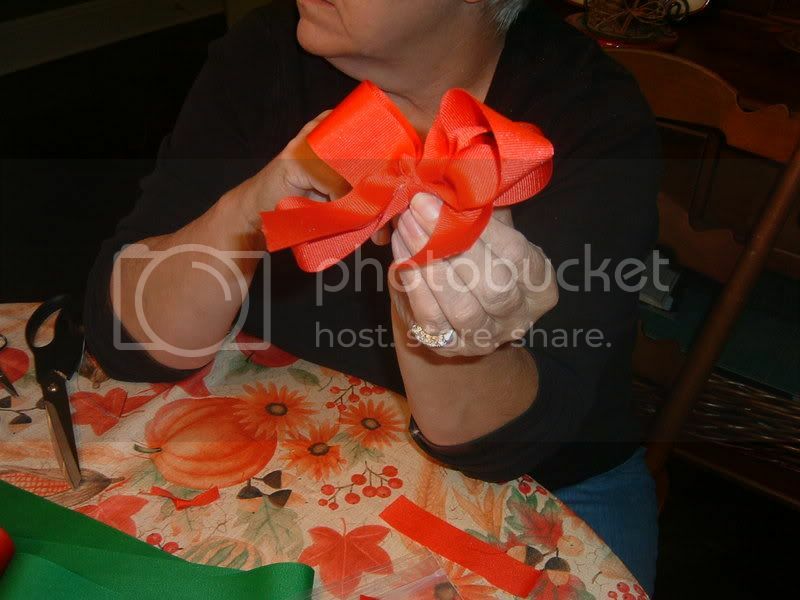 After you make a few this size, you can make larger or smaller bows simply by cutting longer or shorter lengths of ribbon. 2. 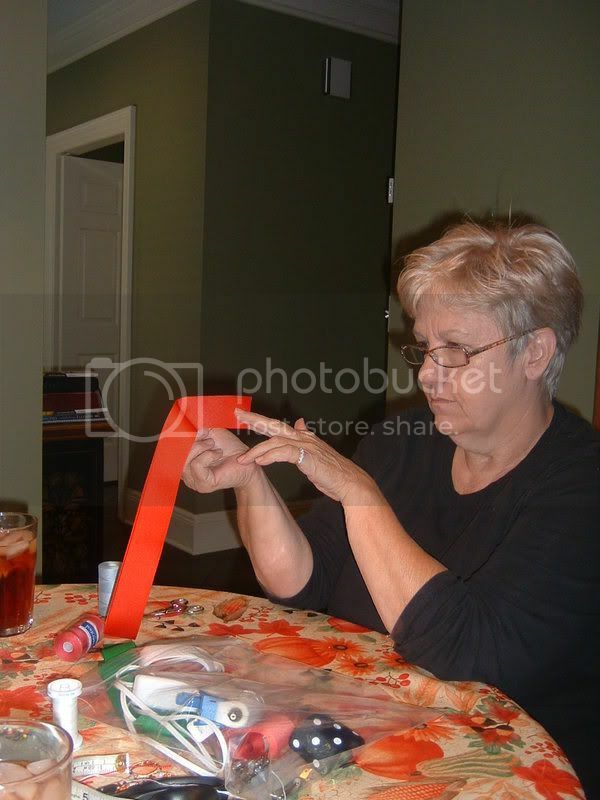 Fold the ribbon in half lengthwise and finger press this crease. 3. Turn up cut ends approximately 3 inches and finger press crease. These will be the tails of the bow and can be cut later to exactly how you want them. 4. 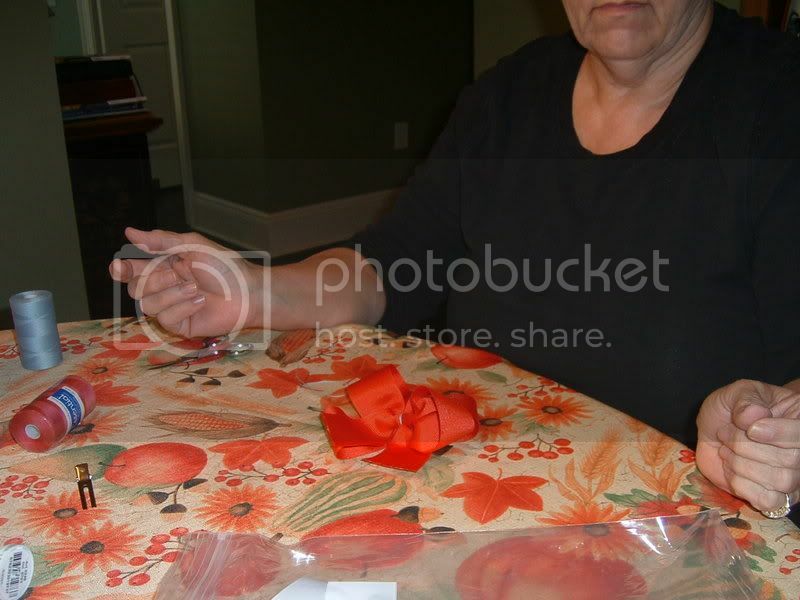 Fold ribbon in half again and finger press crease. Now to fold the bow. 5. Starting on left-hand side, bring 1st fold to 2nd fold at a 45 degree angle. 6. Bring 3rd crease on top or 1st crease at a 45 degree angle. 7. Bring 4th crease UNDER 3rd crease at a 45 degree angle. 8. Bring final crease on top of previous crease at a 45 degree angle. 9. Bring threaded needle from back to the front through in the center through all creases. 10. Take thread over the top of the bow and behind and with thread dangling, start to pull the thread to make the crease in the bow. 11. Wrap thread around the bow several times, shaping loops as you pull thread tight and secure thread in the back. You have just tied the bow. You may have to pull and shape the loops at this point, but as you make more bows, you will see just which loops need a little coaxing. The center of the bow. 12. 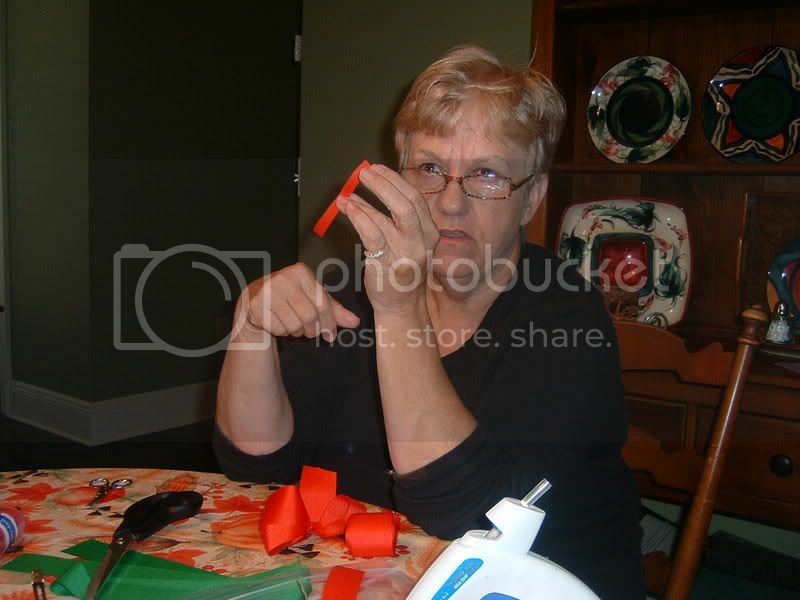 I use a ¼ ribbon for the center. 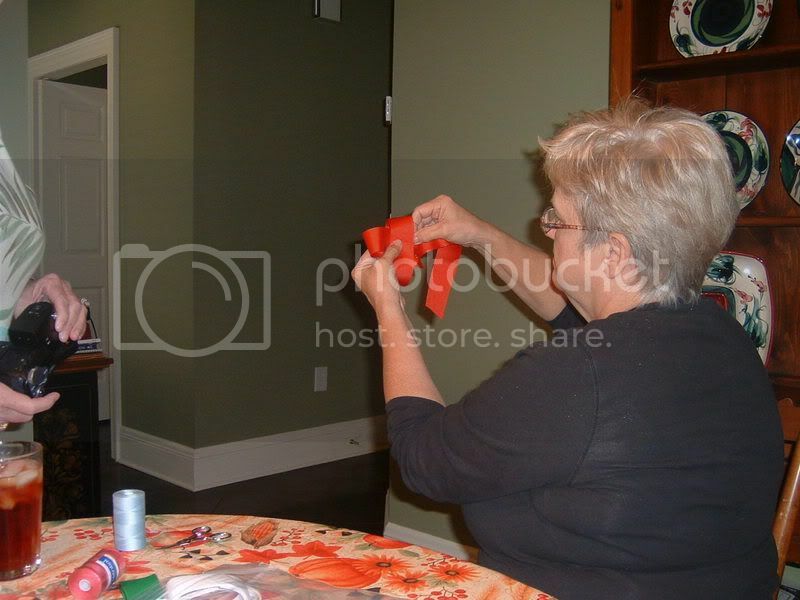 I do NOT buy ¼ ribbon to match the bow. 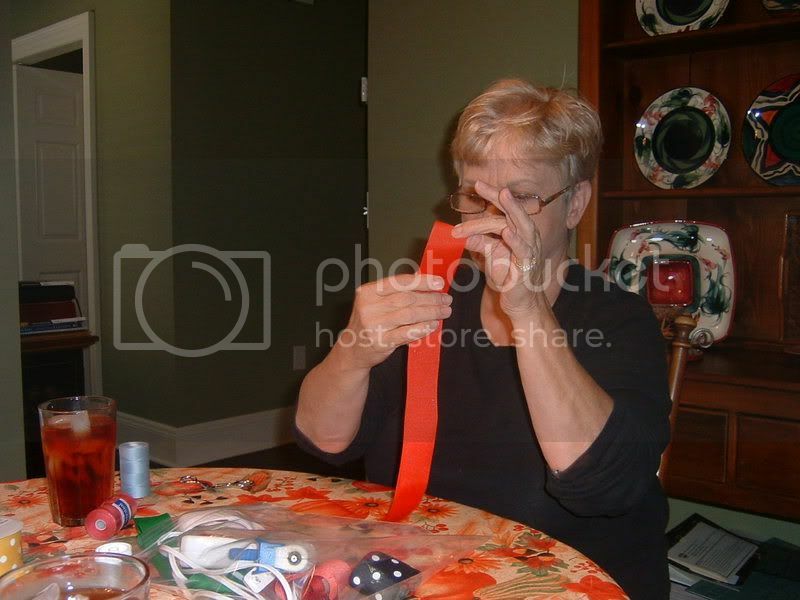 I simply cut a 6-inch strip of remaining ribbon to approximately ¼ inch and use the same method as the tales to seal the cut side. 12. 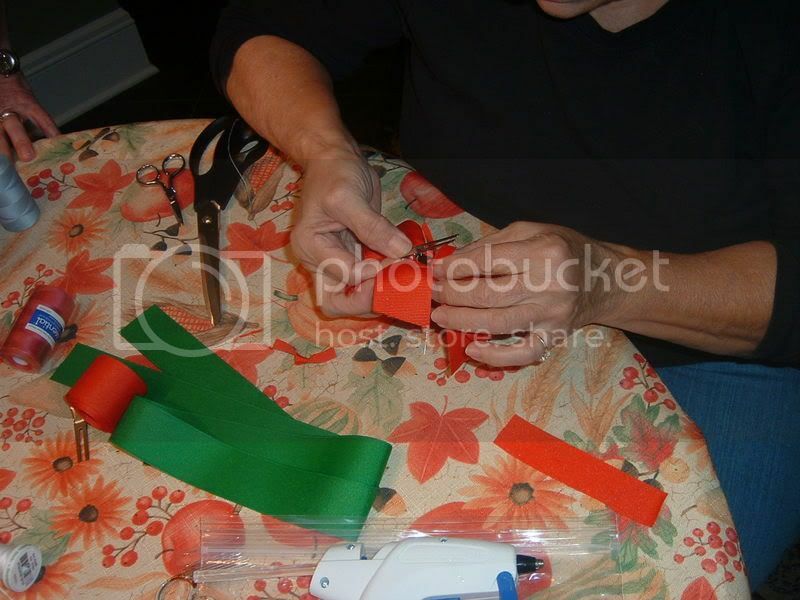 Tie a loose knot in the center of the ribbon – don’t pull it very tight. 13. 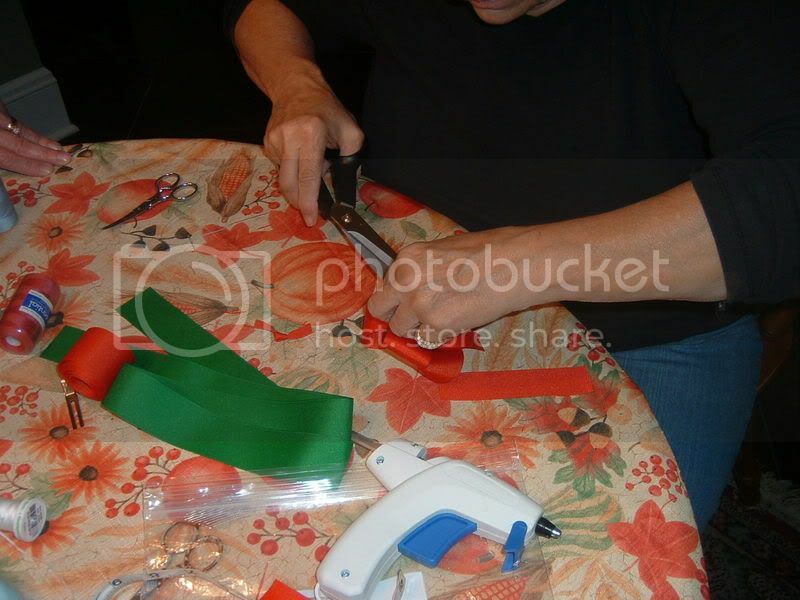 Put a dot of hot glue on the center of ribbon and attach the loose knot on the hot glue. 14. 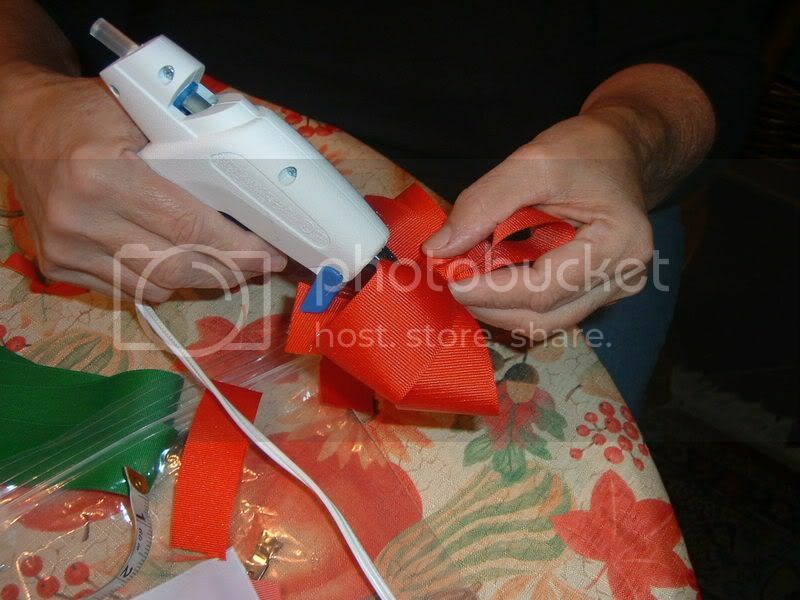 Hot glue the clip to the back of the ribbon. 15. Pull one end of center tie over the clip and hot glue and trim. 16. 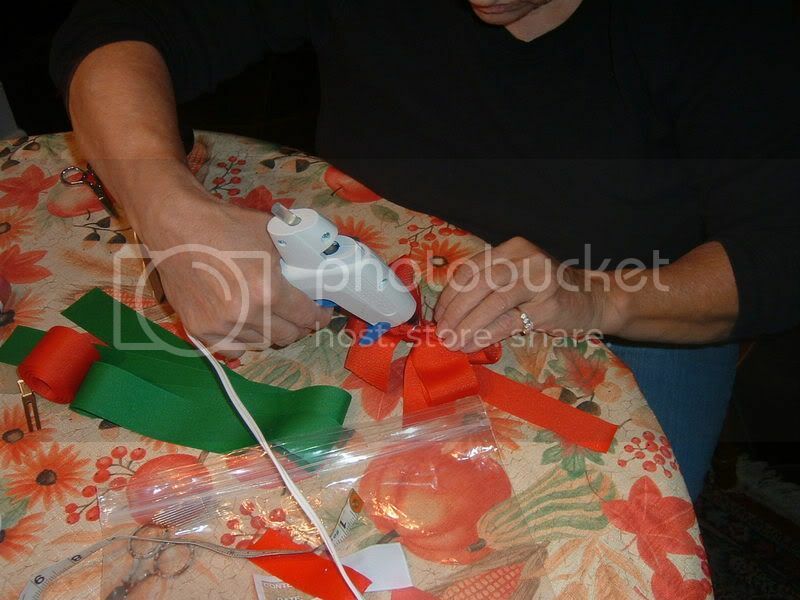 Pull the remaining end over the tie and hot glue and trim. 17. Cut ends of tales the way you want them to look and apply Frey Check lightly to the cut ends. 18. If ribbon seems limp, I spray with spray starch and shape as the starch dries. With a little practice, these bows are adorable and get so easy to tie. 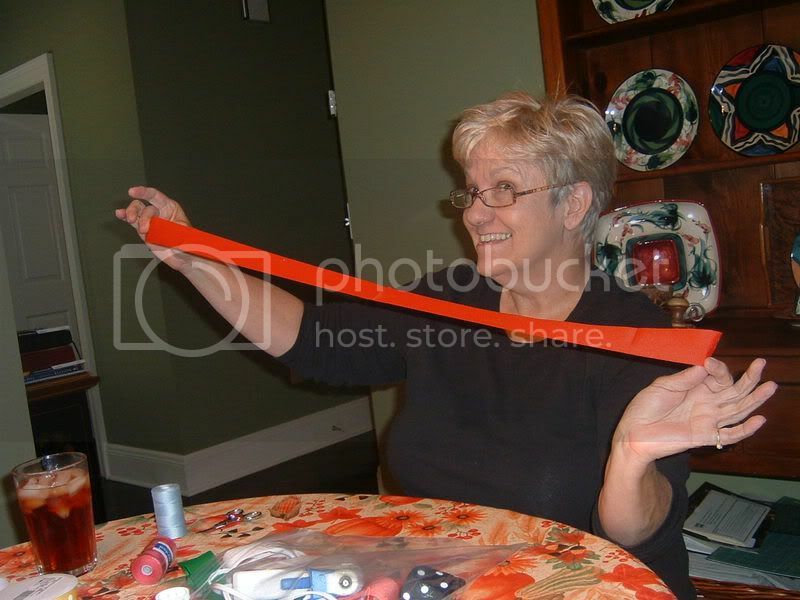 Hints: I use 1 ½ inch ribbon which to me looks the best. 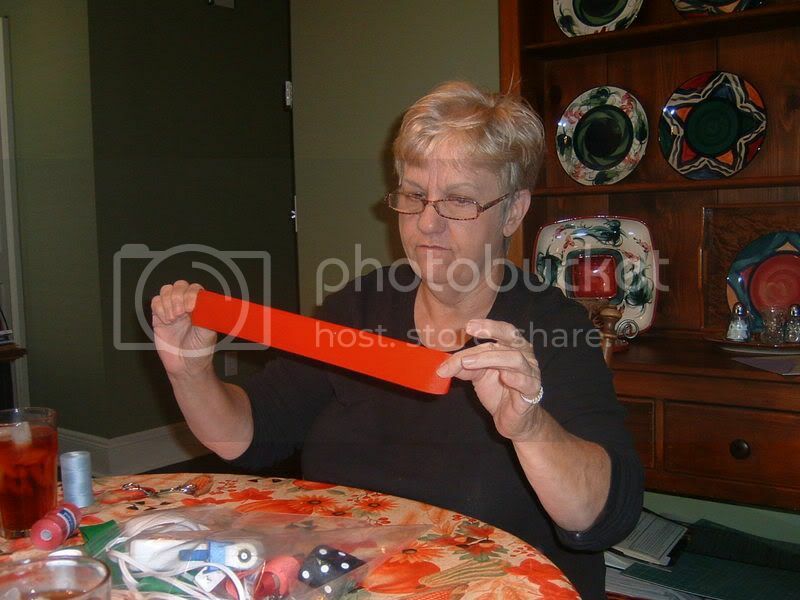 Printed ribbon is best to learn with as you can tell exactly which side is which. 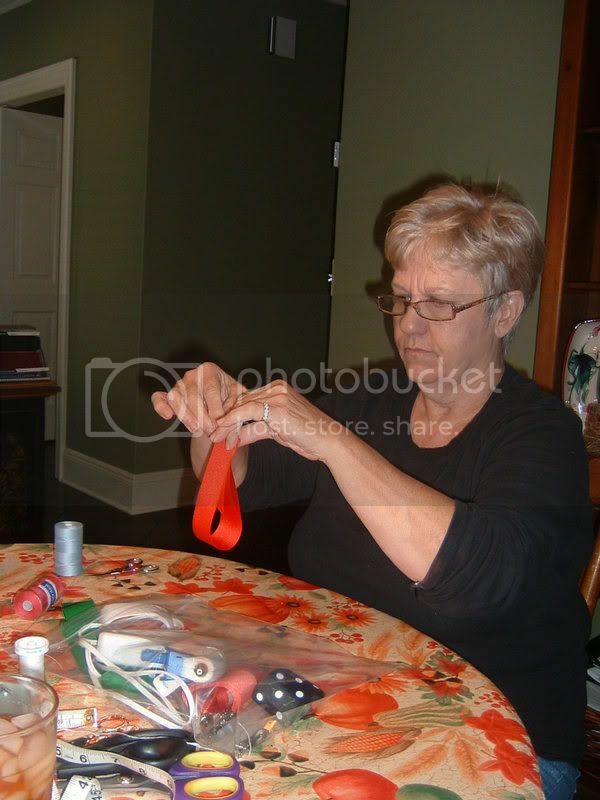 I use hot glue but fabric glue can also be used. It just does not “grab” like hot glue does and also does not dry immediately like hot glue.